Neighbors to Skanska VP: Drop the Contract! 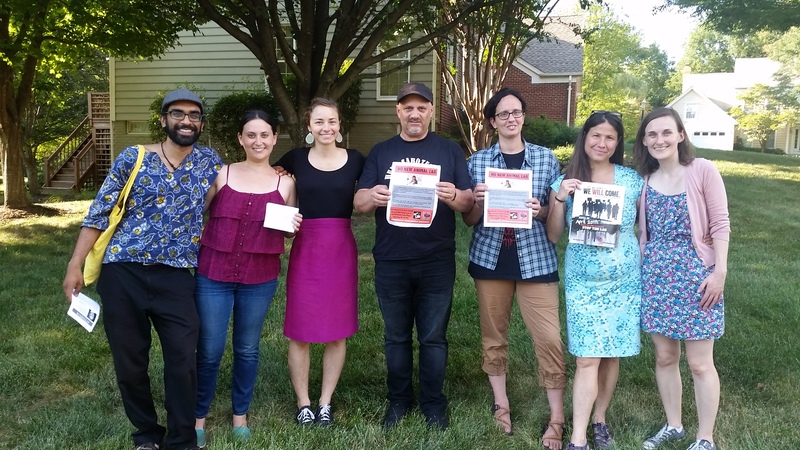 Animal advocates from 4 states, 2 countries, and D.C. visited Skanska Building Executive VP Stephen Skinner’s Sterling, VA neighborhood this weekend to talk about his complicity in animal abuse. They had many positive conversations with his neighbors, and some signed a letter calling on him to do the right thing and drop the contract to build the animal testing lab at the University of Washington. The action, which was one of many carried out across the country as part of the #stormskanska week of action, was an attempt to appeal to Skinner’s morals. Although police were awaiting the group in front of Skinner’s house, the message that Skanska’s executives cannot separate their personal lives from the destructive decisions they make at work was delivered. Multiple actions have now taken place in more than one local Skanska’s executives’ neighborhoods, and it is our hope that Skanska drops the contract with UW soon. If not, we expect that the outrage caused by their role in this torture will only grow. ← DC Stampede Kicks off #stormskanska Week of Action!